Bay Area Roundup Juror Speaks Out about Monsanto’s Shameless Bid to Escape Liability for Groundskeeper’s Cancer. We are previously posted about the reaction of jurors to the court’s proposed ruling tossing the record $289 million verdict against Monsanto. Although that verdict was later reduced to $78.5 million, we have no doubts that the many letters to the court from jurors prevented this historic win from being reversed. Rarely do we see “activist jurors” that continue to remain active in a case once the trial has ended. In this case, ten of the jurors went back to court weeks later to insure all their hard work wasn’t ignored. Recently we obtained one of the several letters sent to the court after Monsanto said it was seeking a new trial. We are reprinting that letter in its entirety. The letter is addressed to Judge Bolanos, the judge who presided during the trial. It is with all due respect that I have to say that what transpired at that hearing was astonishing for several reasons. I feel it is my civic duty to address these reasons with her Honor. First, on the differential analysis of Dr. Nabham. The fact of the idiopathy of NHL was made abundantly clear by more than one witness, as I recall. As Dr. Neugat testified, your Honor, there is a point where a scientist (and a juror I presume) has to use one’s head to assess the facts at hand. In other words, use common sense. Early onset NHL MF, with a relatively short latency, and a rare transformation: there certainly was an elephant in your courtroom room during the differential analysis and is called the “formulated product” that leached through Mr. Johnson’s skin during two soakings in the stuff. Secondly, all parties agreed that the epidemiological leg of the tripod of causation was weaker than the other two, but a tripod with one weak leg stands nonetheless. Again, common sense. Third, the whole discussion of non-economic damages was an embarrassment to the humanity of anybody who was there, except perhaps Monsanto. Any reasonable person in that courtroom, for the hearing or trial, would know that the $33 million in non-economic damages was awarded for the 33 years that Mr. Johnson is not going to enjoy. “Loss of enjoyment of life” was in your instruction to us, twice, as examples of non-economic damages claimed by Mr. Johnson. To alter this award on a technical issue would be a travesty. Common sense and decency. Fourth, your instructions to the jury were crystal clear. You repeated many of the instructions numerous times. We had them in writing and referred to them often. You explained that failure to follow your instructions could result in “sanctions.” Your Honor, we did follow your instructions. Meticulously. Just one example: On the matter of Mr. Wisner’s opening and closing, they were colorful, but I had already disregarded what he said by the time I got to the jury deliberation room, as I had Mr. Lombardi’s opening and closing. Simply following your instructions. Finally, we were presented with witnesses who were clearly managing agents, and not very credible ones indeed. (It seems to me their discussions of strategy, FTO, etc. put them solidly in the “corporate policy” category of your instructions.) You instructed that we could assess the credibility of witnesses and discount their testimony in whole or in part. This is the unwritten and unseen part of this trial. The court stenographer cannot transcribe the physical demeanor or tone of voice of witnesses, hence, your Honor, and we the jurors, are the eyes and ears of the court. To say that Monsanto employees, and at least one expert witness, were clearly uncomfortable would, in my opinion, be a vast understatement. All parties agree that we were an exceptional jury. We were, in fact, praised by Monsanto, and you, your Honor, for our attention, intelligent questions, etc. Yet our integrity, intelligence, and common sense has been cleverly and openly attacked by inference. The idiopathy issue, the science, the non-economic damages issue, what is and what is not evidence, the higher bar for punitive damages, credibility of witnesses: I got it. I believe my fellow jurors got it. With all due respect, your Honor, I don’t see how this can go both ways. Monsanto can’t ask for a jury, state that we intelligently, and with diligence considered only the testimony and evidence, and methodically weighed that evidence— and then turn around and infer that we must have ignored your instructions and did not comprehend the evidence! It just doesn’t add up. The possibility that, after our studious attention to the presentation of evidence, our adherence to your instructions, and several days of careful deliberations, our unanimous verdict could be summarily overturned demeans our system of justice and shakes my confidence in that system. I urge you to reconsider your tentative ruling and to not completely overturn the punitive damages and I also urge you to leave the liability intact. Obviously not every jury will react the same way to the evidence presented in upcoming trials. We remain ready, however, to fight for cancer victims who believe they contracted leukemia, myeloma or lymphoma from exposure to Roundup and other glyphosate based herbicides. 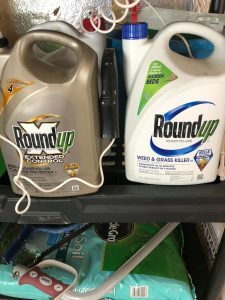 If you or a loved one has cancer and were exposed to Roundup, Ranger Pro or other glyphosate week killers, you may have a claim. Even if a loved one recently passed away or nearing death from his or her cancer, it may still be possible to bring a claim. We are also seeking whistleblowers with inside information about studies and safety data on glyphosate. Feel free to contact anonymously at the numbers and email address above. Finally, we invite you to see our short videos on Roundup cancer claims and becoming a confidential Monsanto whistleblower. Better yet, spread the word and sharing the cancer victim video to anyone who suffers from leukemia, myeloma or lymphoma.